All was started with the fact that in 2010 the Shanghai Huizhong Company, the producer of old copies of Korean Ssang Yong trucks under the brand SHAC, was on the verge of bankruptcy. In September 2010, some of the company's assets were bought by the largest engine manufacturer in China - Weihai Power. CNHTC also drew attention to the assets of the Shanghai Huizhong company, and was bought the documentation for producing of cabins. Why do such a big company like CNHTC need the old korean cabin? It turns out that CNHTC prepares a replacement for its unsuccessful model range Hania, which is produced by Sinotruk Group Jining Commercial Vehical Co., Ltd., one of 4 largest subsidiary of CNHTC. The current cabin, a la Scania, is purchased from a supplier in Hubei province. The own cabin, which is purchased from Shanghai Huizhong, should replace current one. In fact, the Korean cabin is not so bad, because actually it is a German cab from Mercedes-Benz SK! It is a great deal, am I right? But the new model will not immediately replace the Hania range, and will be produced some time in parallel under the name 豪瀚 (Ho Han). Great to see a modernized cabin of the SsangYong SY Truck. I would hardly call this new cab modern. The Benz SK cab was introduced almost 24 years ago in 1988. 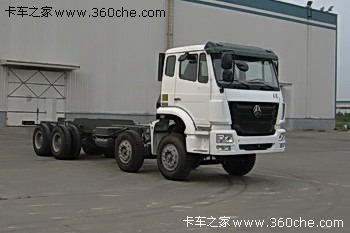 With minor trim changes by Ssangyong and CNHTC's poor outcast sister company Jining Commercial Vehicle (the people that brought you the horribly designed and built Hania), this truck is 10 years behind China's only modern heavy truck, that being FAW's flagship J6P range (which incidently, was independently designed).